I have been asked on more than one occasion whether a player that takes a toilet break during a round of golf should be penalised for undue delay. Like most questions of this nature there is no definitive answer, as there are a myriad of differing circumstances. Rule 6-7 is clear in that a player who unduly delays play incurs a penalty of two strokes in stroke play or loss of hole in match play. However, undue delay is subjective and could depend on a number of factors. For this reason, it is rare for a tournament player to be penalised for breaching this Rule and probably even rarer in Club and Society competitions. I covered an unusual example of US Senior golfer, Peter Oakley, being penalised under Rule 6-7 in this blog last August. Unfortunately, the Decisions book only provides two direct instances of what constitutes undue delay and they are not particularly helpful. Q. A player arrives at a green and discovers that he has left his putter at the tee. He returns to the tee to retrieve the putter. If this delays play, is the player subject to penalty? A. Yes. Rule 6-7 (Undue Delay) and not Rule 6-8a (Discontinuance of Play) applies in this case. Q. If a player searches for a lost ball for ten minutes, is he subject to penalty under Rule 6-7 for undue delay? 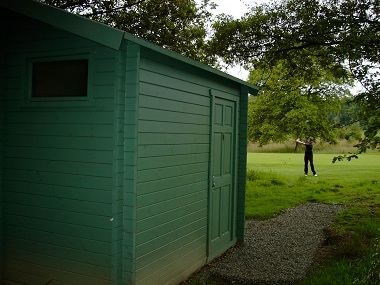 There is nothing in the Rules of Golf that specifically permits or disallows a player from taking a toilet break. Obviously, it happens all the time and many courses have facilities on the course, which help players to conveniently relieve themselves without unduly delaying play, I think that most of us are sympathetic to the needs of a competitor that has to take a break in play in these circumstances and will try and accommodate them by quickening-up our play after they return, or asking a following group to play through. But it might be a different story if we suspect that a competitor is using a toilet break as a reason for composing themselves after a bad run of play, or purposely interrupting the momentum of another player. In these cases the Committee should be informed and they would then have to make their decision as to whether a penalty should be imposed under Rule 6-7. A further consideration is whether the player's urgent needs could be perceived to be a physical problem. Decision 6-8/3 rules that this would also be a matter for the Committee to consider. Rule 6-8a (iv) permits a player to discontinue play because of sudden illness and the player incurs no penalty if he reports to the Committee as soon as practicable and the Committee considers his reason satisfactory. The Decision indicates that it would seem reasonable for a Committee to allow a player 10 or 15 minutes to recuperate from such a physical problem but ordinarily allowing more time than that would be inadvisable. A good rule of thumb before calling a penalty for undue delay on an unfortunate fellow competitor, who has to relieve themself during a round, may be to put yourself in their position. If they have done everything possible to minimise their temporary absence then it would be a hard-hearted person who insisted on a penalty. My sincere thanks to whoever authored this Kindle review on Amazon re my eBook, ‘999 Updated Questions on the Rules of Golf 2012-2015'. "Fantastic, easy to understand explanations by the author Barry Rhodes. Amazing how many so-called experienced golfers get even the basic Rules wrong. Have used Barry's book to great effect on numerous occasions. Would give it 999 stars if I could." You can either purchase my eBook from Amazon or directly from me via this link. P.S. If you have already purchased my eBook I would be grateful if you could spend the time to write a short review of it at Amazon (US) or Amazon (UK). Great Blog.I also love the way Google and your website have great "search" engines to assist us amateur golfers when researching a particular point. My question is two fold. 1) Are there any penalties that when imposed on the golfer post scorecard submission mean the player is not DQ'd? My thought here is that any penalty imposed on a player post score submission must mean a DQ as the player would have signed an incorrect scorecard? 2) Rule 6-7/1. Is this an example of the above, where after being reported to the committee the player who left his club signs his card without the 2 shot penalty (eg 4 ball better ball stableford comp)...isnt DQ'd but the Committee simply add 2 shots to his score for the hole in question?